#2) Available, artificial, interior light. e.g. a mix of incandescent, florescent and/or candle light. NOTE: I always do these candle light images with and without the star-cross filter just in case the bride and groom don’t like this effect! This is one of those churches that had incandescent can lights overhead and florescent lights lighting the back wall at the altar! When I first saw this I was appalled—you expect fluorescents in a grocery store but in a church? Well, after some testing (digital made this soooo easy!) I found I really liked the color differences created by the miss-matched color temperatures. This is one of the reasons I attend the wedding ceremony rehearsal. I want to know and see how the church coordinator is setting up their ceremony events. The bride and groom usually have no clue how to do these things—like the candle lighting and their first kiss—and the coordinator just tells they when they will be doing these things—Not HOW! That’s when I jump in. 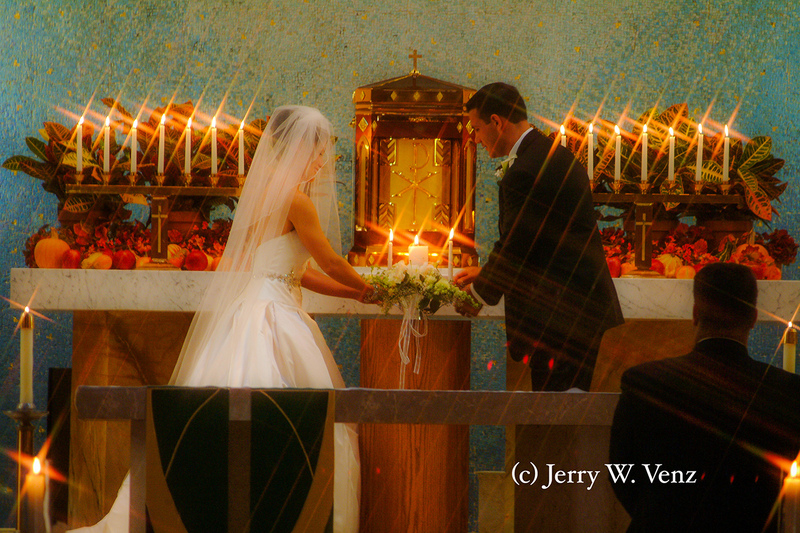 I want the bride and groom to rehearse these events MY WAY, so that I can photograph them. So, for the candle lighting I tell them to move slowly and stop and hold when they light the unity candle (2 second rule) and when they place their candles in the stand (2 second rule again). I also tell them where to stand so all the guests can see them do the lighting (and so I can photograph it from the back of the church!). Then there’s the First Kiss—my 2 second rule applies here as well. I tell them I want AT LEAST a 2 second kiss and I have them practice this at the rehearsal. The family and wedding party always cheer this! By repeating the 2 second rule more than once there is a better chance they might remember to slow down. 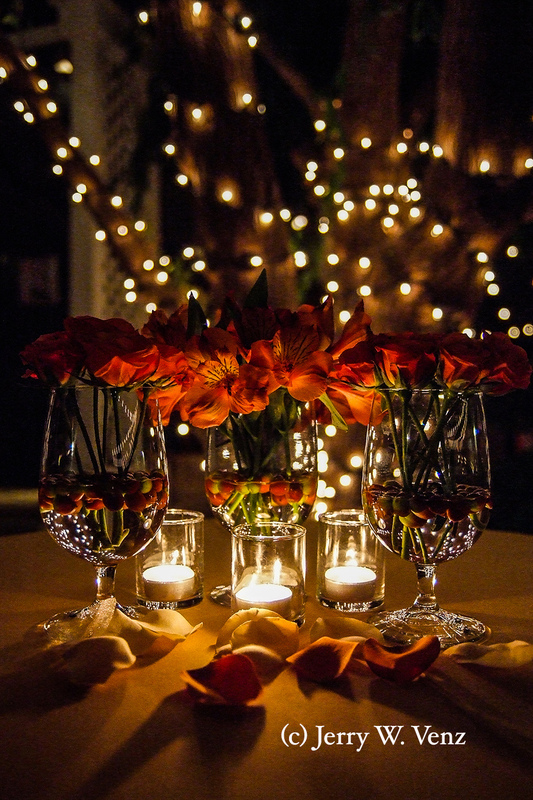 This technique of mixing candle light with other types of light is a very nice way to capture the atmosphere at the reception as well. I use it for images of their table decorations, the cake table and their place settings. I built this image, like most of my images, from the background—forward. That is I started with that background (the twinkle lights in the tree) and I placed my subject against it. 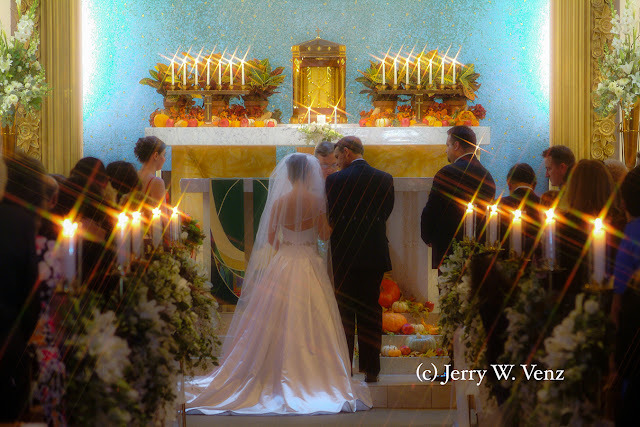 In this instance I rotated the flower goblets, placed the votive candles, and last, placed the flower petals in front. Just a nice little still-life I “found” at their wedding! In the final part of this series, I’ll talk about the, sometimes necessary evil, flash! ’Til next week…should you have questions please don’t hesitate to ask.